A skill prized for many generations, splitting firewood is a truly useful and wonderful skill that anyone can be proud to have. Anybody who’s ever spent hours in the yard splitting firewood knows that the job is difficult enough without having to deal with an inferior tool that’s not up to the task at hand. That’s why for many reasons it’s crucial to have the very best tool for the job. Being able to choose the best axe for splitting wood can save you hours and hours of grueling work and can reduce the impact on your body. In order to choose the right axe, it’s important to understand a little bit about how a splitting axe functions and what to look for when choosing the right splitting axe for your needs. We’ll teach you everything you need to know to find the right ask for your personal situation. There are a variety of things to keep in mind when looking for the rights splitting axe for your needs. It’s also important to keep in mind that different users may be suited for different axes depending on variables like their skill level, their height and strength and other personal preferences. More experienced and stronger users might want to consider using a splitting maul, which utilizes a heavier head to generate more force at impact. Keep in mind that choosing the right axe can also vary depending on the type of job you are doing. It will be important to consider the density of the wood being split and also to consider whether the wood contains many knots that could make splitting more difficult. You will also need to consider the length of the wood being split as a longer piece of wood will need more force to be split properly. One of the first variables to consider is the length of the wood being split. Generally speaking, splitting a longer log Will take more force then if you were splitting a shorter log. It would also be beneficial to consider the type of wood being split, as dancer woods like oak and hickory may require more force to split. While this is an obvious point, the primary goal when splitting wood is to successfully split the log with a single swing. This goal is helpful in order to reduce the strain that splitting wood has on your body, as the more effort it takes to split a log the quicker you will tire out. When choosing an axe for splitting wood it’s very important to choose the head weight that is right for your personal needs. A heavier head wait for the axe means that each swing generates increased force in comparison to a smaller axe head. This increased force allows for larger logs to be split with a single swing but it also more quickly drains the user and increases wear and tear on their body. The goal therefore is to find the sweet spot of axe head weight that leads to maximum effectiveness in splitting wood while minimizing the impact on your body. You also want to consider your level of strength in order to find the right axe head weight for your situation. If you choose and axe that is too large for you, you will tire more quickly and therefore you may be more likely to make a mistake while splitting wood. As safety is such an important matter while splitting wood, handling an excessively large axe for you may lead to injury if not used properly. That’s why it’s so crucial to find the right fit for your needs. While many people consider the handle material for their axe as an aesthetic preference, there are a few practical matters to keep it in mind when weighing your options. The classic and iconic handle for an axe is made from wood, usually hickory or ash for their toughness and added durability. A great benefit of wood handles is that they can be easily replaced in the event that they are damaged or broken. However, the reality is that wood handles are also more likely to be damaged than other materials such as heavy-duty plastic. For reasons explained later, wood handles may be a better choice for more experienced users. While they are considered less traditional, axe handles made from heavy duty plastic are much more common nowadays. These plastic handles are usually more durable than wood handles and therefore they can handle additional misuse that may come from a less experienced user. While they are more durable, it’s important to keep in mind that these handles are likely to be much more difficult to replace. Therefore, plastic handles on axes are considered to be a great choice for less experienced users or beginners just getting started in splitting wood. It’s important to give careful thought to the length of the axe handle. While it is true that longer handles allow for more force, they also can lead to less control when swinging the axe. As more control generally allows for a more consistently sized piece of firewood, it’s may be valuable if the logs are to be used in a wood stove or furnace. As shorter handles allow for more precision, they are generally a good fit for less experienced users. For both safety and performance reasons, taller users should consider an axe with a longer handle. Generally speaking, users with less experience should consider the handle material for their axe carefully. An inexperienced user generally swings a splitting axe with less accuracy and therefore they are more likely to hit the handle on the log. A handle made from less durable materials such as wood may break if it makes contact with the log being split. Therefore a durable plastic handle may provide some additional safety in the event that the handle meets the log. Crafted with care by German smiths and featuring a Swiss made handle, this 28″ splitting axe from Helko Werk is a great tool that is highly capable for most jobs. The axe head is constructed from high-grade carbon steel that is designed to provide extra durability and reduce the likelihood of nicks. Is a great tool for those looking for the best pound for pound performance from a splitting axe. Handcrafted from top-notch materials and featuring a timeless design, this is a great axe for those looking for a lifelong tool that can be passed on to future generations. Some users may find the handle a bit short for their preferences if they are accustomed to swinging a larger splitting axe. This axe would be greatly complemented with the addition of a larger splitting maul that would be used to split the large rounds. All in all this is a great ax to be able to swing all day with ease and without tiring. Featuring cutting-edge materials and modern design, this 36″ splitting axe from Fiskars has the proper weight distribution to generate massive force at impact. The blade on this axe is seriously sharp and can help make splitting even large size logs easy. As this axe is a bit long at 36 inches, Fiskars recommends that this axe is best suited for taller or stronger users. As such, this might be a good choice for those who have some experience with log splitting and want to up their game for a reasonable price. 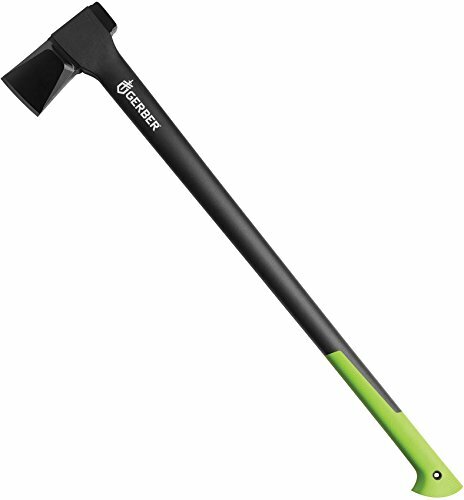 This 36-inch long splitting axe from Gerber features a modern and sleek design. Utilizing a hollow handle made from lightweight modern materials, this ax is designed to deliver more force to the head of the axe at contact. The handle is designed to be shock absorbent in order to reduce strain on the user over time. 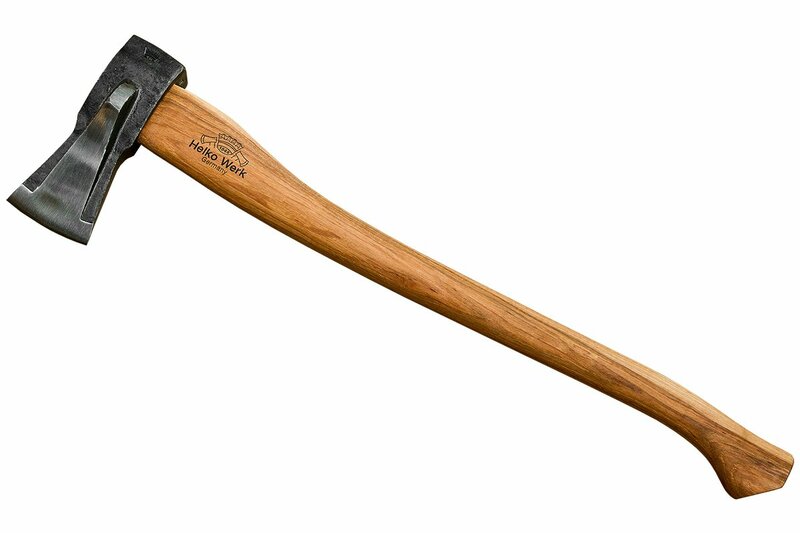 As this is a rather long axe, this might be a good choice for users who are experienced with splitting wood. While many users have commented on the sharpness of the blade out-of-the-box, others have reported slight shipping on the blade which may be due to a softer head than ideal. 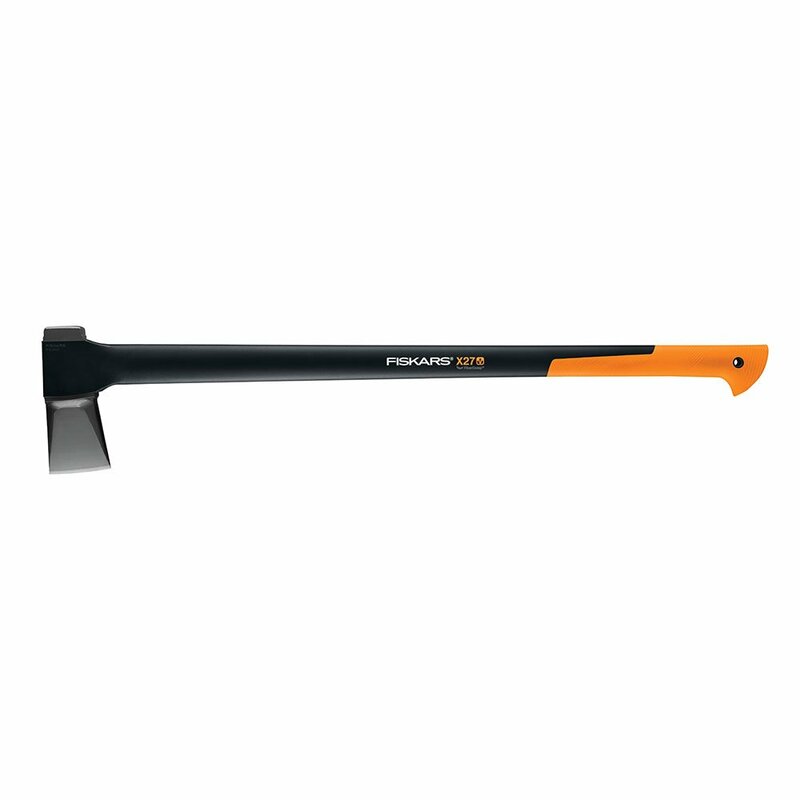 Designed by the Fiskars team in Finland, the 28″ Fiskars X25 splitting axe is a great all-around choice for splitting wood. Featuring a hollow handle made of composition materials that deliver more weight to the head of the axe, this axe is designed to deliver optimal force at contact. It also features a modern design that many consider being very sharp looking. As it has a shorter handle than some of the other models, there’s asked might be a great choice for users first starting out with splitting logs. While lightweight, the composite handle is quite durable and provides additional protection in case the handle is accidentally struck while splitting a log. This makes it a great choice for users who are just getting started with splitting wood. A Swedish company with more than 100 years of experience in handcrafting axes, Gränsfors Bruks has what it takes to produce top-quality axes that display stunning craftsmanship. 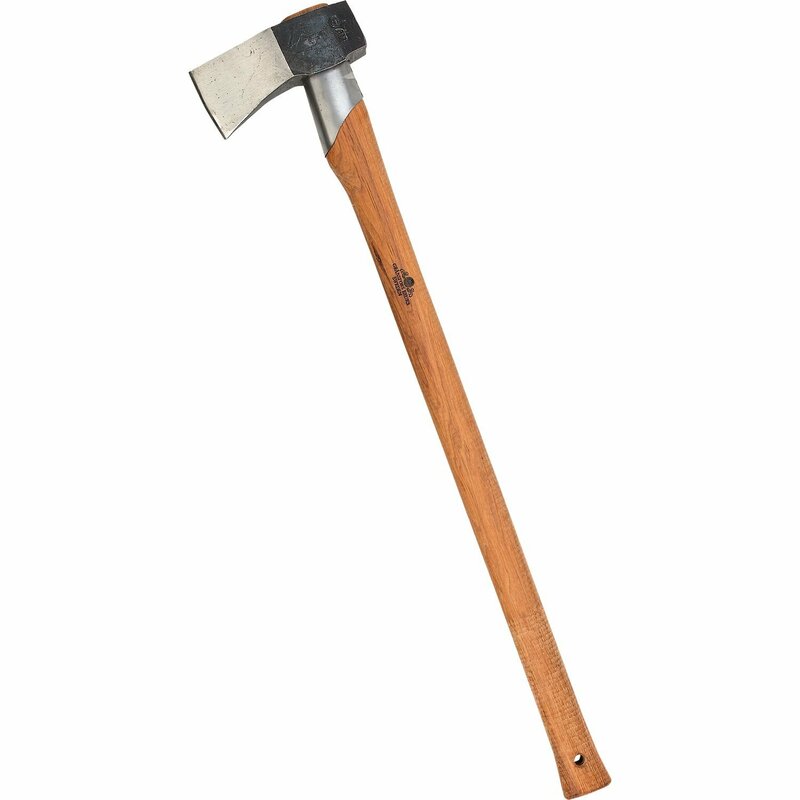 This 31-inch axe from Gränsfors Bruks has the iconic look of the traditional ax head as well as a tough hickory handle. Each axe head is forged by a single smith that signs their initials once their work is complete. As this axe is a mid-length axe that is light weight, it is a great option for a wide variety of users due to its versatility. Built for a lifetime of use, this splitting axe is the kind of quality product that gets passed down from generation to generation. It features a durable and sharp edge that needs less sharpening than most other splitting axes on the market. 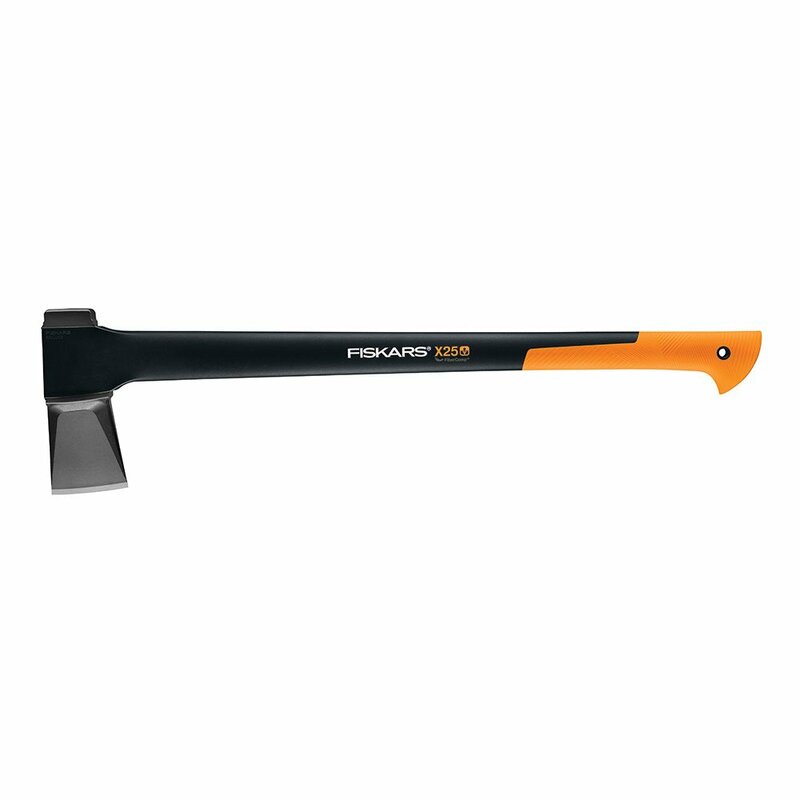 The clear winner for the best axe for splitting wood is the Fiskars X27 Splitting Axe. Though it may be best suited for stronger or more experienced users, this axe features a modern design that results in the explosive splitting of logs. While the Fiskars X25 may be a better axe for less experienced or weaker users, we feel that the X27 provides the most exceptional performance for a sensible price. Featuring a low-maintenance sharp edge, a durable handle and a length capable of explosive power, we find this axe to be an excellent all-around choice.